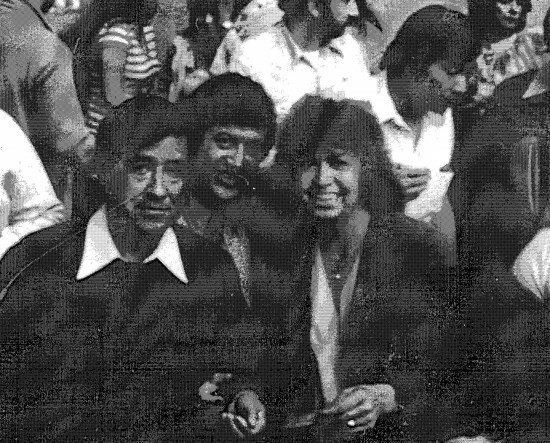 UFW Stories: "Cesar Chavez visits Colorado to support Migrant farmworkers"
"Cesar Chavez visits Colorado to support Migrant farmworkers"
In 1979 Cesar Chavez came to Denver to support Colorado migrant farmworkers, which is part of my history and background. The program I worked for in Boulder organized a reception for him in Denver, and I had the honor of ensuring we had food he could eat; he was fasting at the time. During the same visit, the United Mexican American Students (UMAS) and Migrant Action Program (MAP) students from the University of Colorado at Boulder invited Cesar to the campus for a rally in his honor. My husband, Patrick Sanchez, was Director of UMAS at the time and we were able to capture a moment with Cesar on camera. For such a humble man, Cesar was a powerful presence, and that one moment has remained a cherished memory.